Last summer, while reading the ServeTheHome.com website, I saw a great link to Ebay for Mellanox ConnectX-3 VPI cards (MCX354A-FCBT). These cards where selling at $299 on ebay. I took three of the awesome cards. 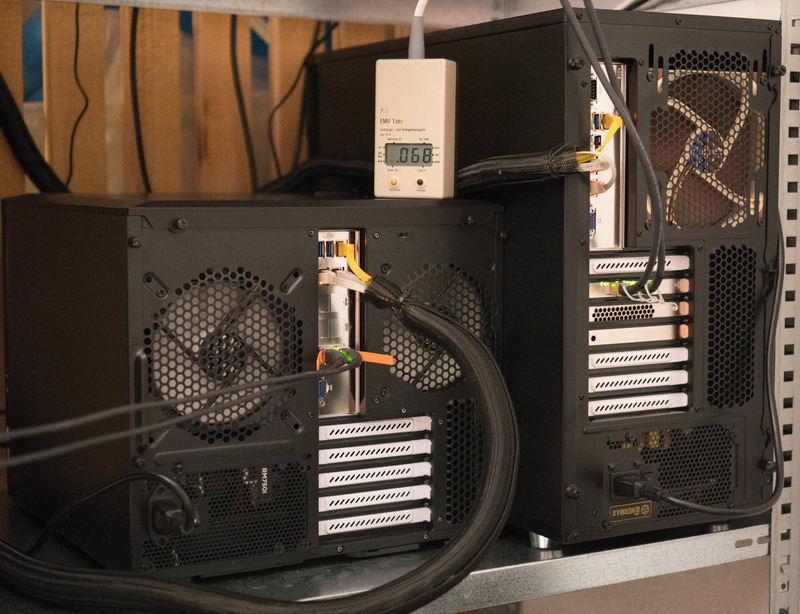 These Mellanox ConnectX-3 VPI adapters where simply too good to be true… Dual FDR 56Gb/s or 40/56GbE using PCIe Generation 3 slots. Having three of these Host Card Adapters without a InfiniBand switch is limiting. 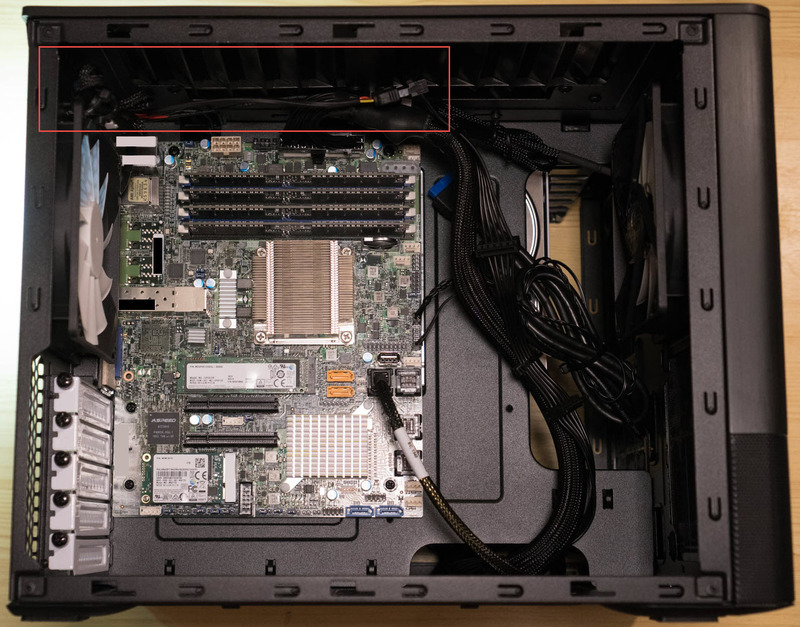 With my new Homelab 2014 design, I now have two vSphere hosts that have PCIe Generation 3 slots, and using a simple QSFP+ Fiber Cable, I can create a direct point-to-point connection between the two vSphere hosts. 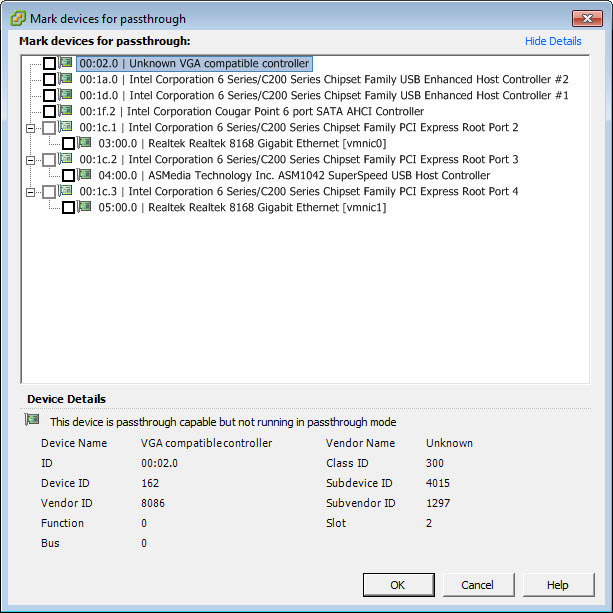 The Mellanox Firmware Tools (MFT) that can run within the vSphere 5.5 and allow to check the state of the InfiniBand adapter and even update the firmware. Installing the tools is very straight forward. Unfortunately it requires a reboot. 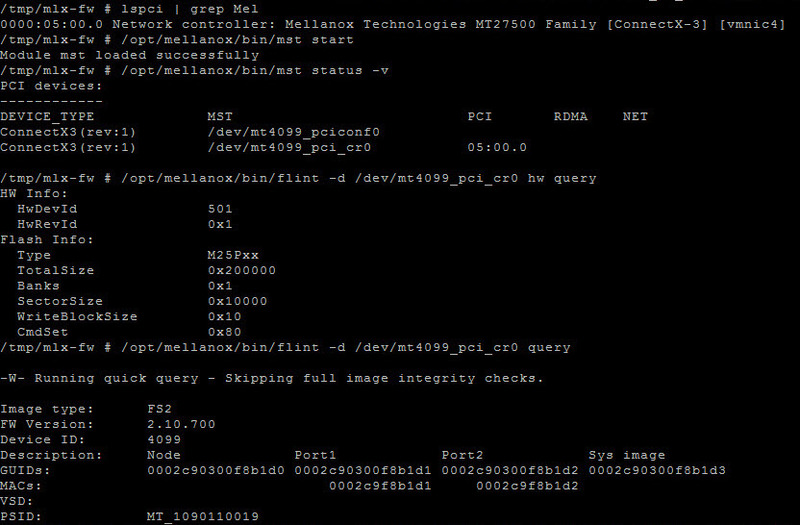 The next steps going to be to start the MST service, check the status of the of the Mellanox devices and query them to check the current level of firmware. I don’t need to have the Mellanox MST driver running all the time, so I will simply start it using /opt/mellanox/bin/mst start. Next we will query the state of all Mellanox devices in the host using /opt/mellanox/bin/mst status -v from which we will get the path to the devices. We then use the flint tool to query the devices to get their stats. which returns us the current Firmware version and the GUIDs and MACs for the host card adapters. 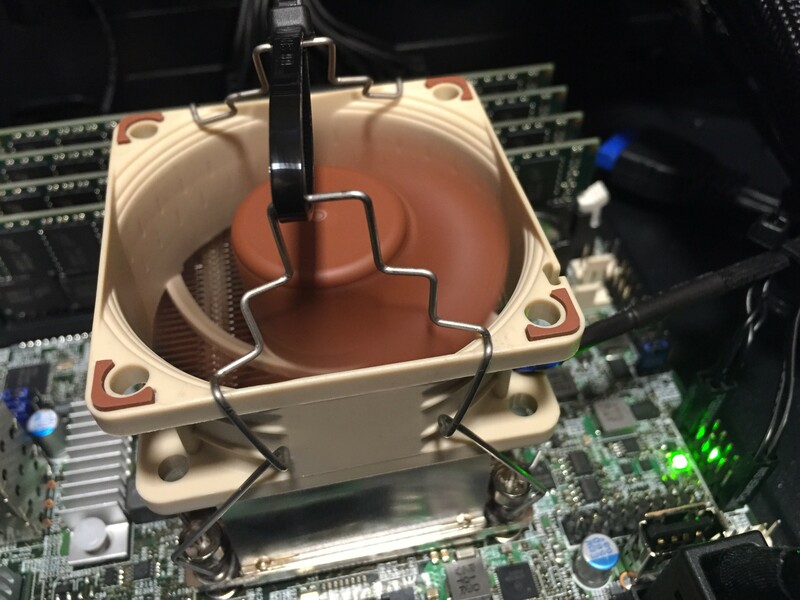 /opt/mellanox/bin/flint -d /dev/mt4099_pci_cr0 -i /tmp/mlx-fw/fw-ConnectX3-rel-2_30_8000-MCX354A-FCB_A1-FlexBoot-3.4.151_VPI.bin burn does the trick. 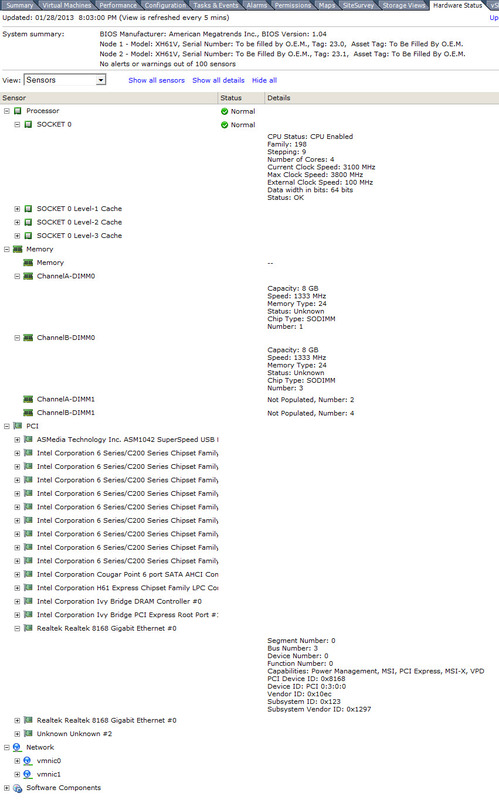 And we can quickly check the new running firmware on the InfiniBand adapter. Update 20 March 2014. 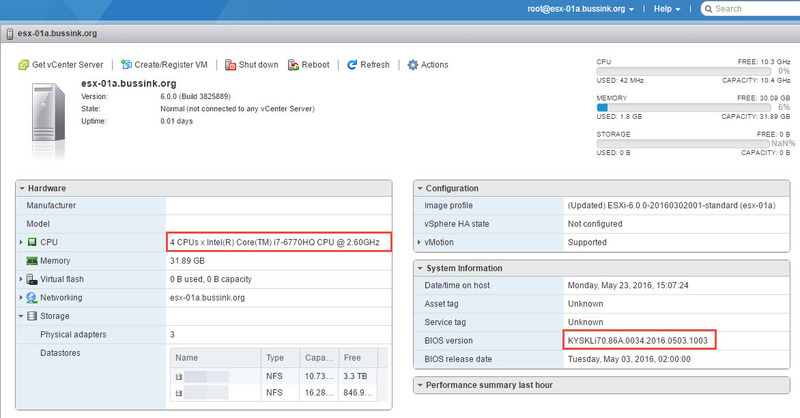 With the release of VMware ESXi 5.5.0 Update 1, this blog post is once again very popular. A lot of other articles, blogs and forum discussions have been using the Realtek R8168 driver link to my website, and this is starting to take an impact on my hosting provider. I therefore have had to removed the direct links to the R8168 & R8169 drivers on this page. 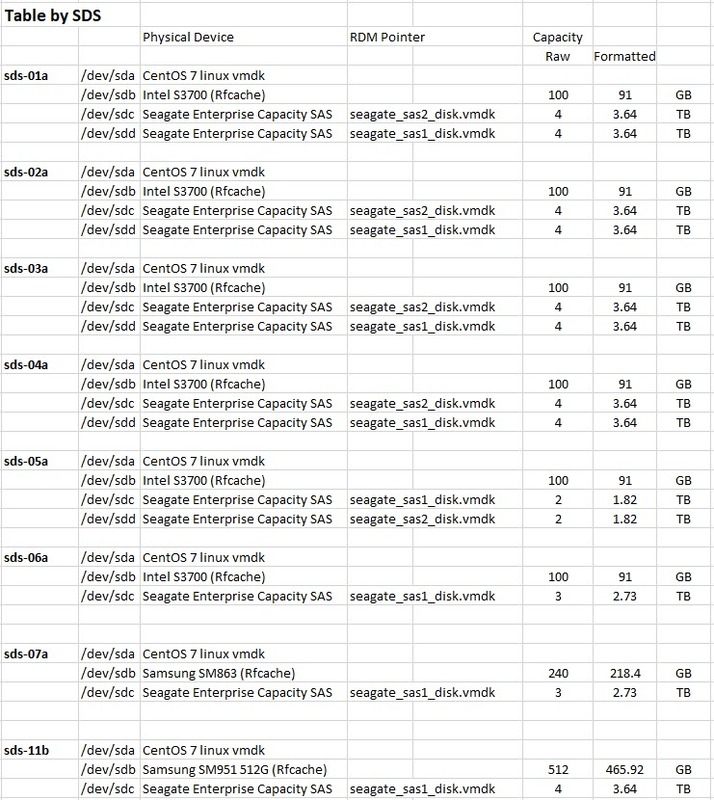 These drivers are very easy to extract from the latest ESXi 5.1.0 Update 2 offline depot file which you can get from my.vmware.com . You just need to open the .zip file in a 7zip/winzip and extract the net-r8168 driver and use it with the ESXi Customizer. The ESXi 5.5.0 Build 1331820 that came out yesterday, did not include any Realtek R8168 or R8169 driver in it. So if your homelab ESXi host only has these Realtek 8168 network cards, you need to build a custom ISO. 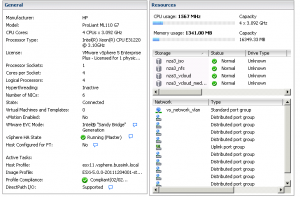 The most simple tool to use is Andreas Peetz’s (@VFrontDE) ESXi Customizer 2.7.2 tool. 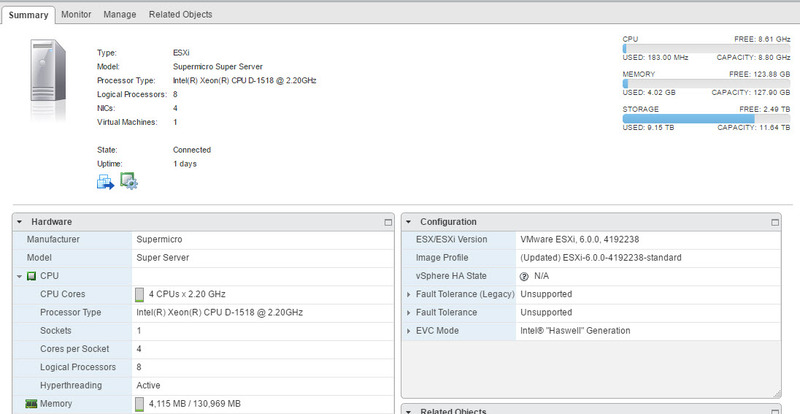 The ESXi Customizer tool allows you to select the ESXi 5.5.0 ISO file and include into it a new Driver in .vib format. You can then download and extract the VMware Bookbank NET-R8168 driver from vSphere 5.1 ISO or download it from the following link for your conveniance. This will create a ESXi-Custom.ISO file that you can burn to a CD and use to install vSphere 5.5 on your host. It’s now 2013, and it’s time to have a peak at my homelab refresh for this year. In the past three years, I’ve ran a very light homelab with VMware ESXi. I mainly used my workstation (Supermicro X8DTH-6F) with Dual Xeon 5520 @2.26Ghz (8-Cores) and 72GB of RAM to run most of the virtual machines and for testing within VMware Workstation, and only ran domain controllers and 1 proxy VM on a small ESXi machine, a Shuttle XG41. This gives a lot of flexibilty to run nearly all the virtual machines on a large beefed up workstation. There are quiet a few posts on this topic on various vExpert websites (I highly recommend Eric Sloof’s Super-Workstation). I sometimes do play games (I’m married with a gamer), and when I do I have to ensure my virtual machines are powered down within VMware Workstation, as my system could and has crashed during games. Having corrupted VM is no fun. Having purchased a flat, I don’t have a technical room (nothing like my 2006 computer room) or a basement. So having a few ESXi hosts on 24 hours a day, requires a high Wife Acceptance Factor. The system have to be small & quiet. In addition, if they are power efficient, it will make the utility bill easier. 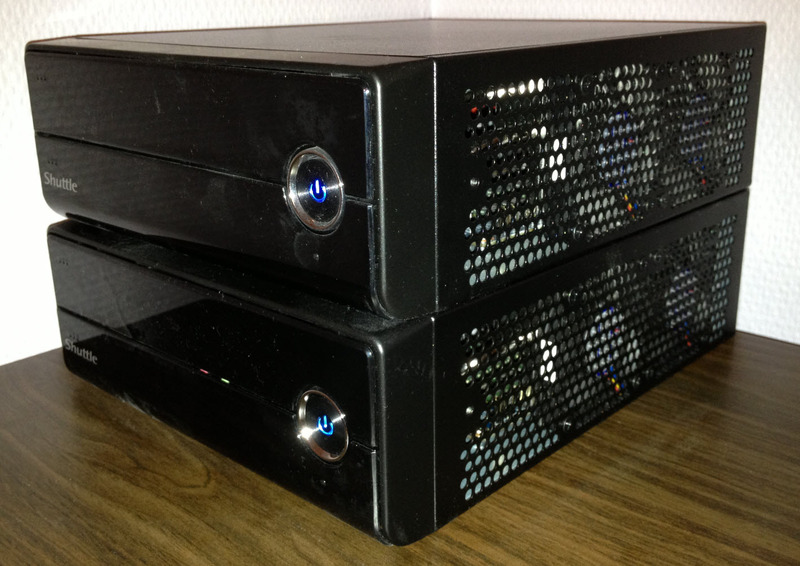 The Shuttle XH61V is small black desktop based on the Intel H61 chipset. 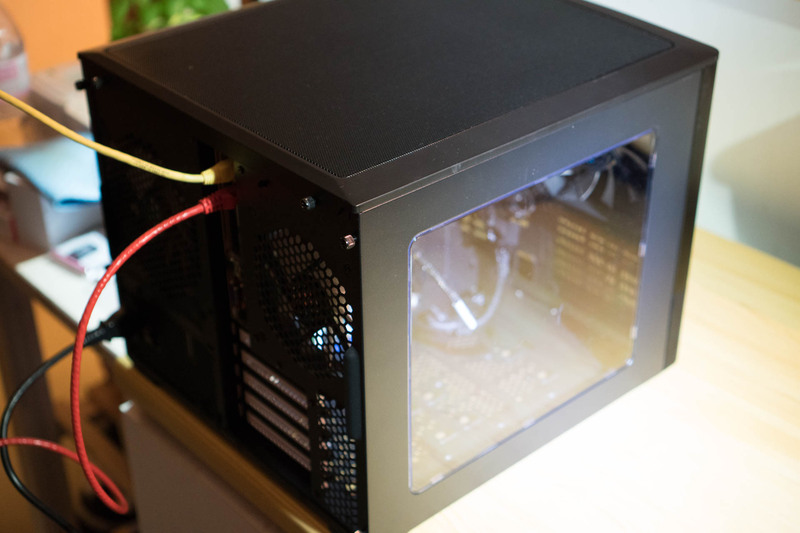 It comes in a 3.5L metal case with very quiet ventilators. 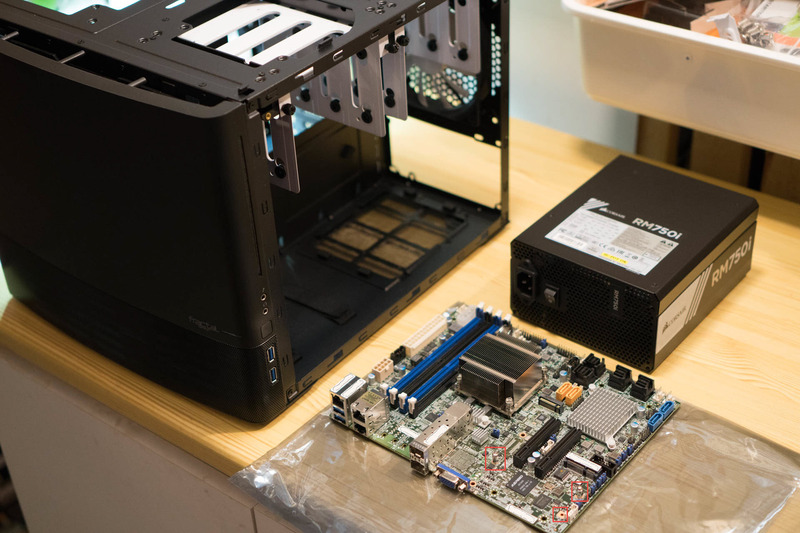 You just need to purchase the Shuttle XH61V, a Intel 1155 Socket 65W processor, two memory SODIMMs (laptop memory) and local storage. Assembly can be done in less than 30 minutes. 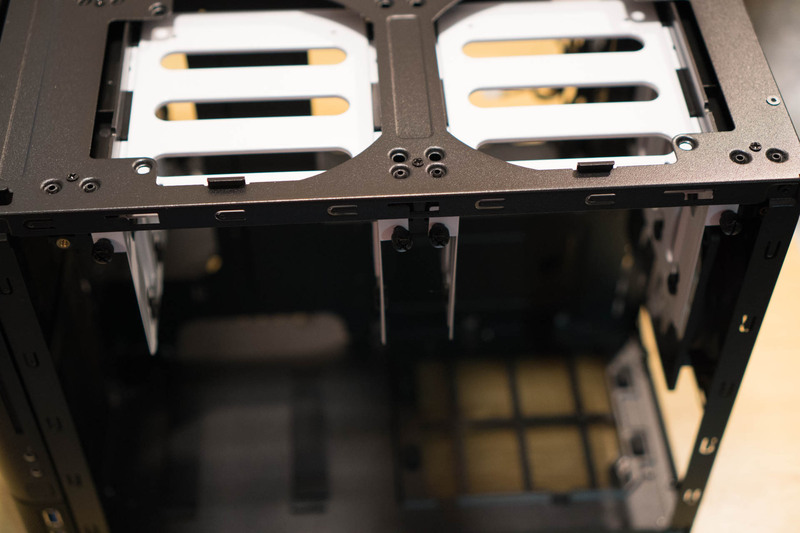 The Shuttle XH61V comes with two NICs and support for a mSATA (Bootable) connector, a PCIe x1 slot, and two 2.5″ Devices. The Shuttle XH61V comes with two gigabit network cards. They are Realtek 8168 cards. These work flawlessly, but they do not support Jumbo frames. Installing VMware ESXi is done quickly as all the devices drivers are on the ESXi 5.1 VMware-VMvisor-Installer-5.1.0-799733.x86_64.iso install cdrom. 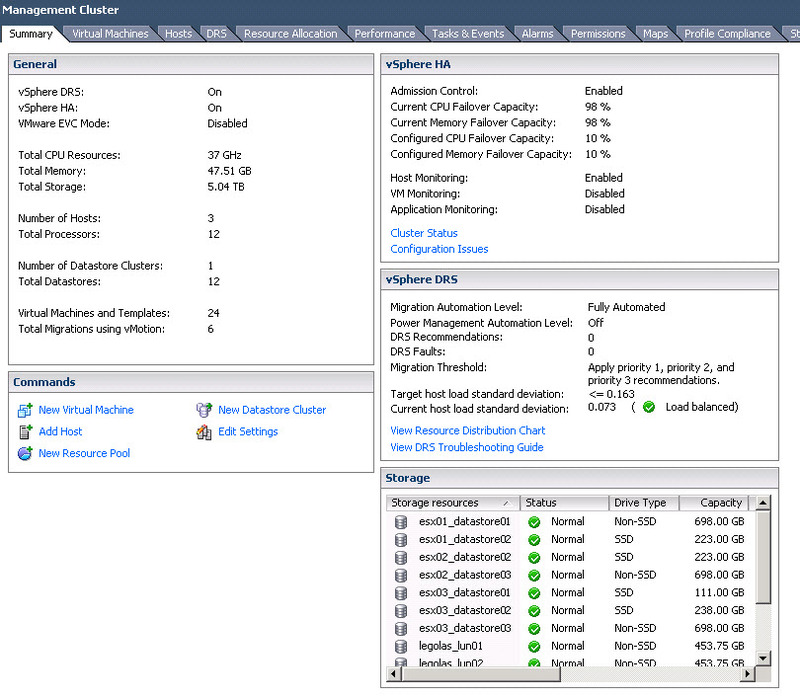 Here is an updated screenshot of my vSphere 5.1 homelab cluster. 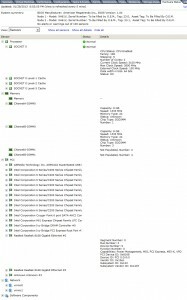 Here is my updated bill of materials (BOM) for my ESXi nodes. Planned upgrade: I hope to get new Intel SSD 525 mSATA boot devices to replace the older Kingston SSDnow when they become available. 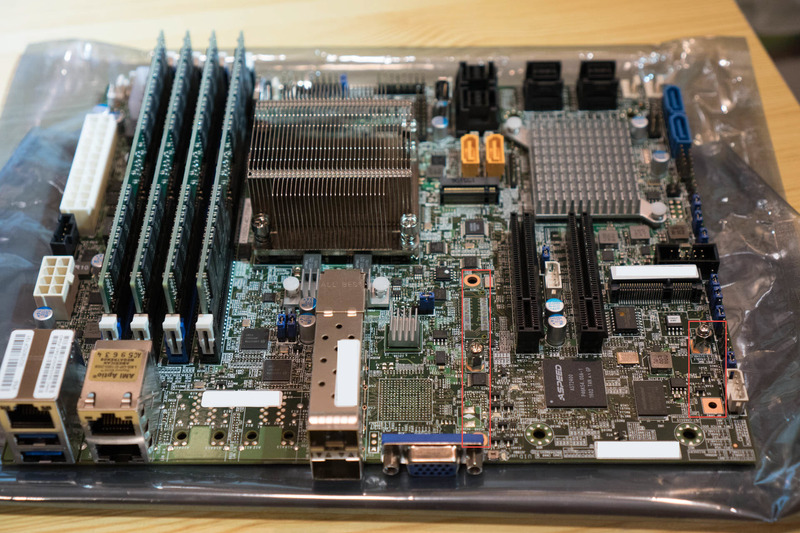 In my bill of materials, I selected the most powerful Intel Core i7 processor that I could fit in the Shuttle XH61V. Because I’m running virtual appliances and virtual machines like vCenter Operations Manager, SQL Databases, Splunk. There are some less expensive Core i3 (3M Cache), Core i5 (6M Cache) or Core i7 (8M Cache) processor that would work great. What is impressive, is that the Shuttle XH61V comes with a 90W power adapter. We are far from the 300W mini-boxes/XPC or even the HP MicroServer with their 150W power adapters. 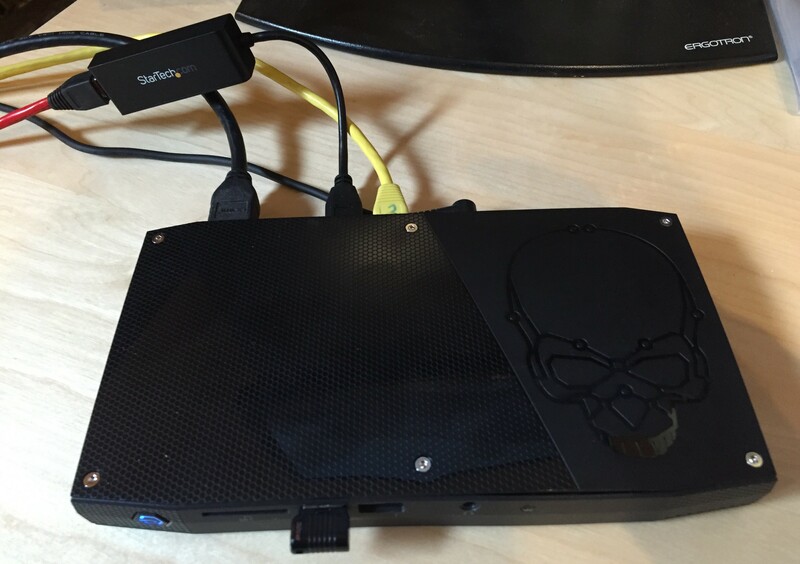 Only the Intel NUC comes lower with a 65W power adapter and a single gigabit network (@AlexGalbraith has a great series of post on running ESXi on his Intel NUC ). Just for info, the Intel Core i7-3770S has a cpubenchmark.net score of 9312. Which is really good for a small box that uses 90W. The pricing for a Shuttle XH61V with 16GB memory and a USB boot device (16GB Kingston USB 3.0) can be kept to a about $350 on newegg. 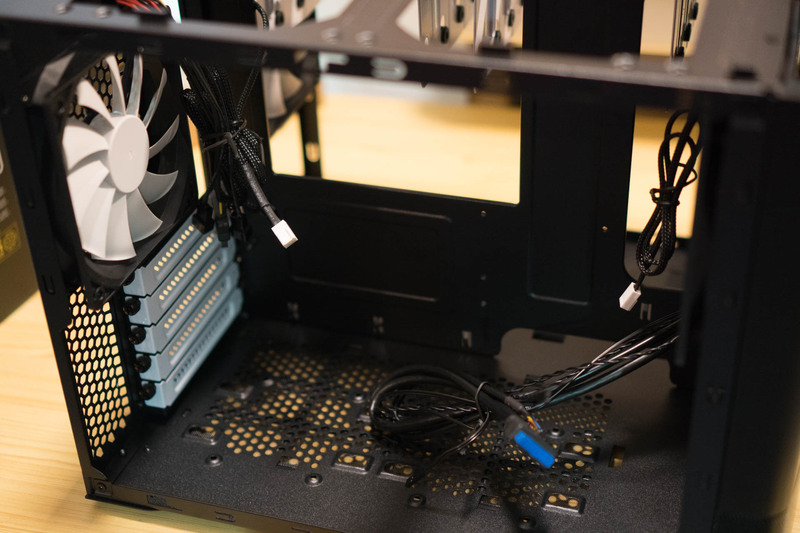 What will increase the price is the performance of the LGA 1155 Socket 65W processor ( Core i3-2130 from $130 to Core i7-3770S at $300) and what additional local storage you want to put in. The sizing of the homelab in early 2013 is so far from the end of 2006 when I moved out of my first flat, when I had a dedicated Computer room. 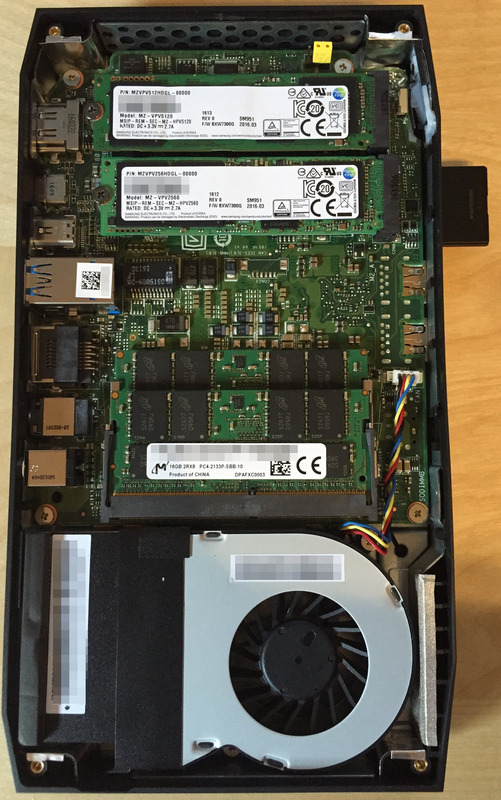 I’ve decided to replace the Intel 525 30GB mSATA SSD that is used for booting ESXi and to store the Host Cache with a larger Intel 525 120GB mSATA SSD. This device will give me more space to store the Host Cache and will be used as a small Tier for the Temp scratch disk of my SQL virtual machine. 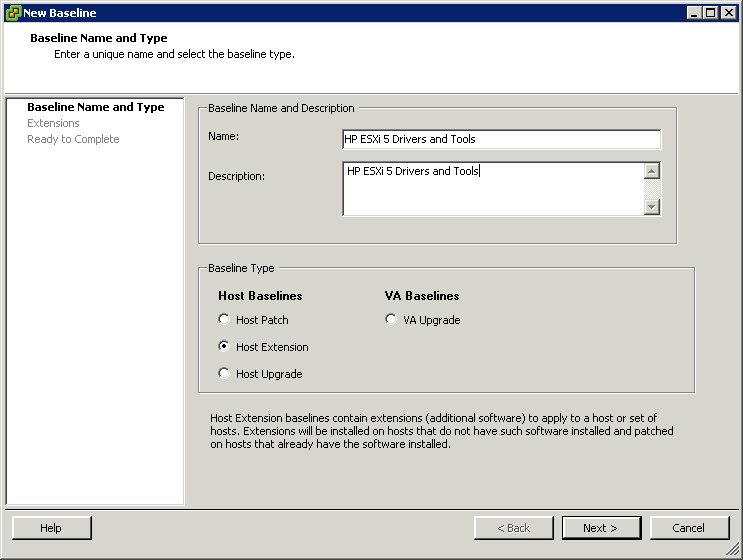 This post will explain how to use the vCenter Update Manager to create a custom Hewlett-Packard Extensions baseline, so that you can install the HP Drivers on your ESXi install and the HP CIM Management Tools. Having just purchased a set of HP Proliant ML110 G7, I found out that HP has release at least two sets of drivers for ESXi 5.0. 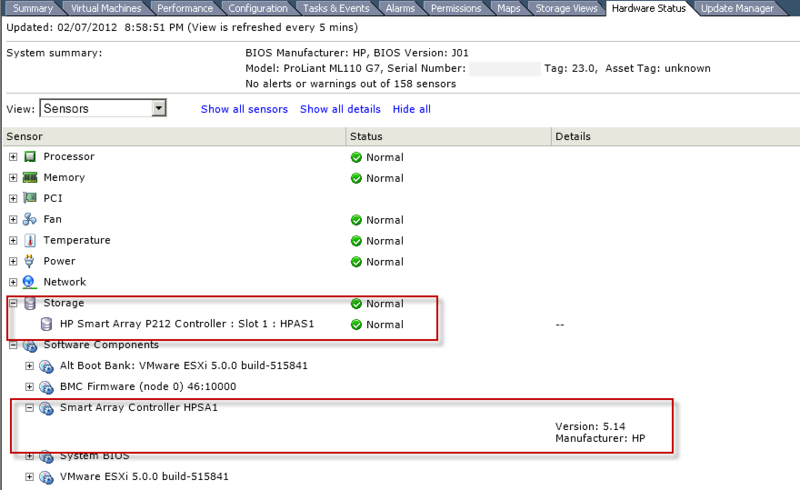 The first one is the VMware ESXi 5.0 Driver CD for the HP SmartArray version 5.0.0-24.0 released on 2011/08/22. I recommend that you download this driver from the VMware website on your vCenter and extract it in a convenient place, as we will need the hpsa-500-5.0.0-offline_bundle-537239.zip file. We will come back to this file later. 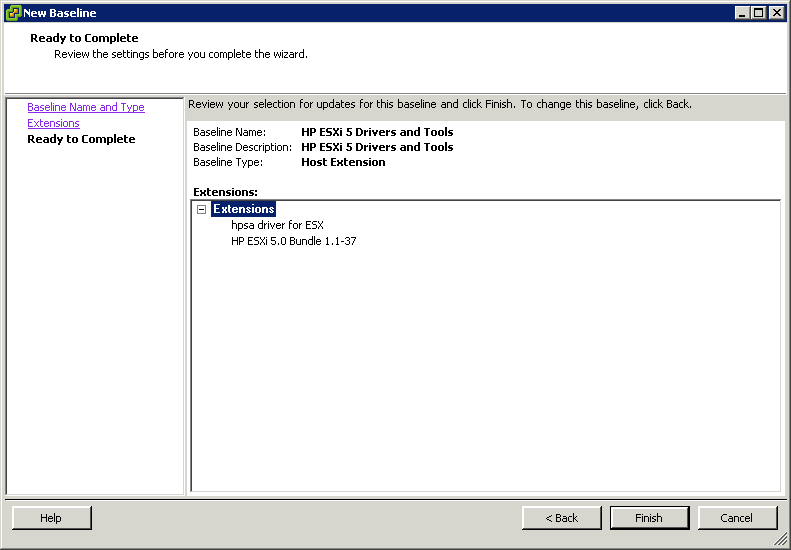 The second one is the HP ESXi 5.0 Offline Bundle now in version 1.1 since December 2011. 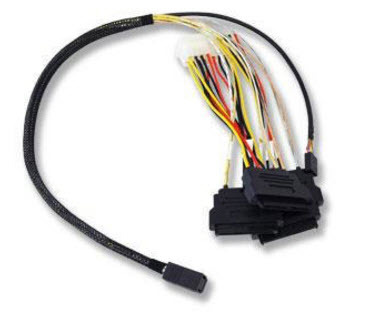 This bundle contains multiple drivers such as the HP Common Information Model (CIM) Providers, HP Integrated Lights-Out (iLO) driver and HP Compaq ROM Utility (CRU) driver. Download this file but don’t extract it. 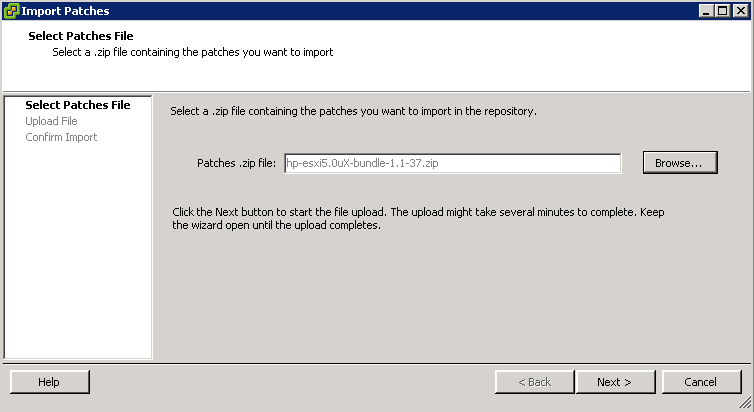 We will use the file hp-esxi5.0uX-bundle-1.1-37.zip as is. 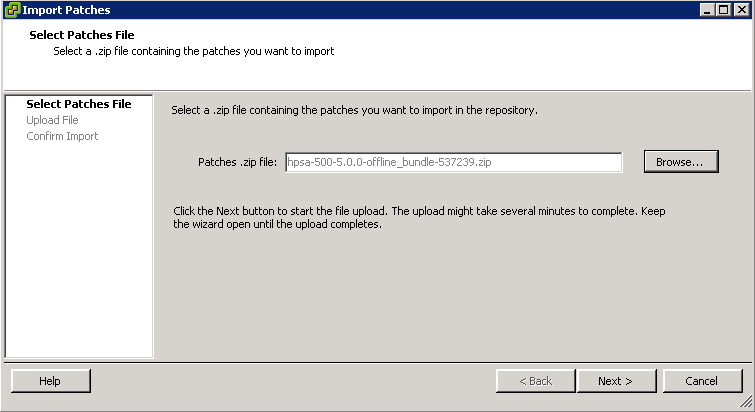 On your vCenter, jump to the Update Manager Administration pane, and select the Import Patches option. We will now create a new Baseline Extension for these offline patches so we can apply them to our HP servers. Lets attach this new Baseline Host Extension to our HP ML110 G7 Cluster and Scan the Cluster. 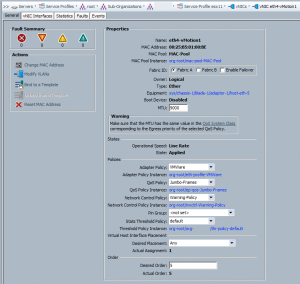 We can now Remediate our HP Proliant ML110 G7 host with the new Host Extension. Please note that you cannot remediate VMware Patches and the Host Extensions at the same time. You will need to do this in two passes. and after having the remediation. 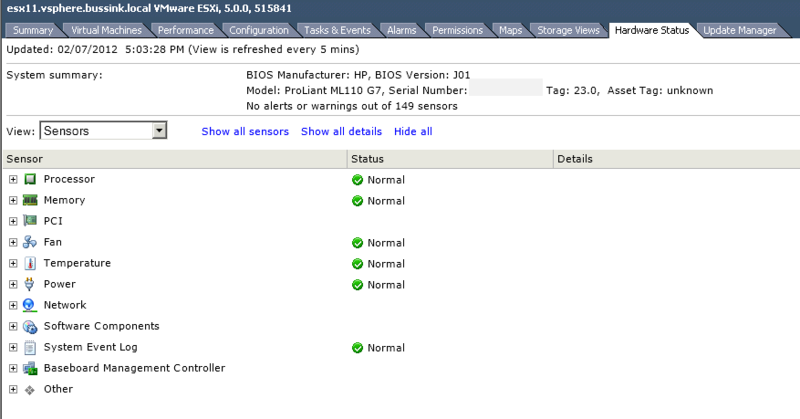 Thanks to these drivers, we could now see the HP SmartArray Array Status if there where any disks attached to it. Last friday, I came across this very interesting deal, Two HP ProLiant ML110 G7 with Xeon E3-1220 (Quad-Core @3.1Ghz) for the price of one. So Two HP ML110 G7 for $960 seemed a great bargain to me. I got some extra Kingston memory and I should have some decent lab servers. 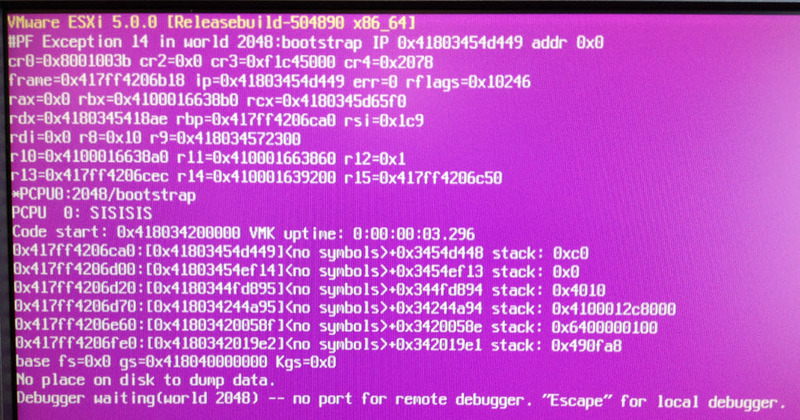 But when I started installing VMware ESXi 5.0.0 Build 504980 on the HP ML110 G7 it kernel dumped. After having filmed the crash, the last thing that came up before the crash was ACPI. 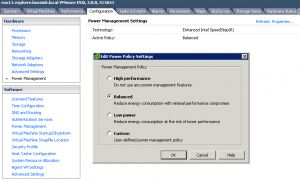 In order to allow ESXi to control CPU power-saving features, set power management in the BIOS to “OS Controlled Mode” or equivalent. Even if you don’t intend to use these power-saving features, ESXi provides a convenient way to manage them. 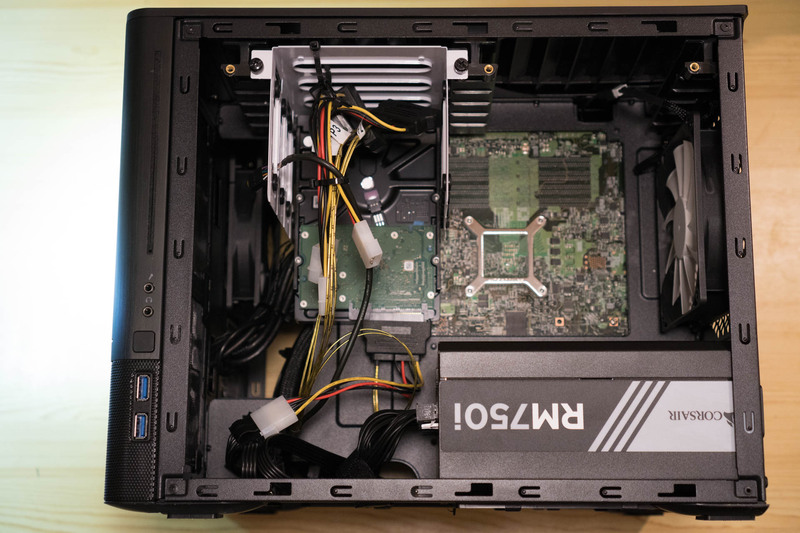 NOTE Some systems have Processor Clocking Control (PCC) technology, which allows ESXi to manage power on the host system even if its BIOS settings do not specify “OS Controlled mode.” With this technology, ESXi does not manage P-states directly, but instead cooperates with the BIOS to determine the processor clock rate. On HP systems that support this technology, it’s called Cooperative Power Management in the BIOS settings and is enabled by default. This feature is fully supported by ESXi and we therefore recommend enabling it (or leaving it enabled) in the BIOS. Availability of the C1E halt state typically provides a reduction in power consumption with little or no impact on performance. When “Turbo Boost” is enabled, the availability of C1E can sometimes even increase the performance of certain single-threaded workloads. We therefore recommend that you enable C1E in BIOS. 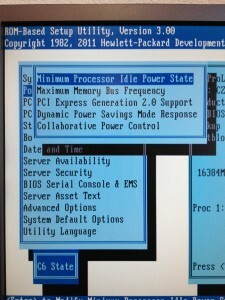 So I modified the Power Management settings in the HP ML110 G7 BIOS. 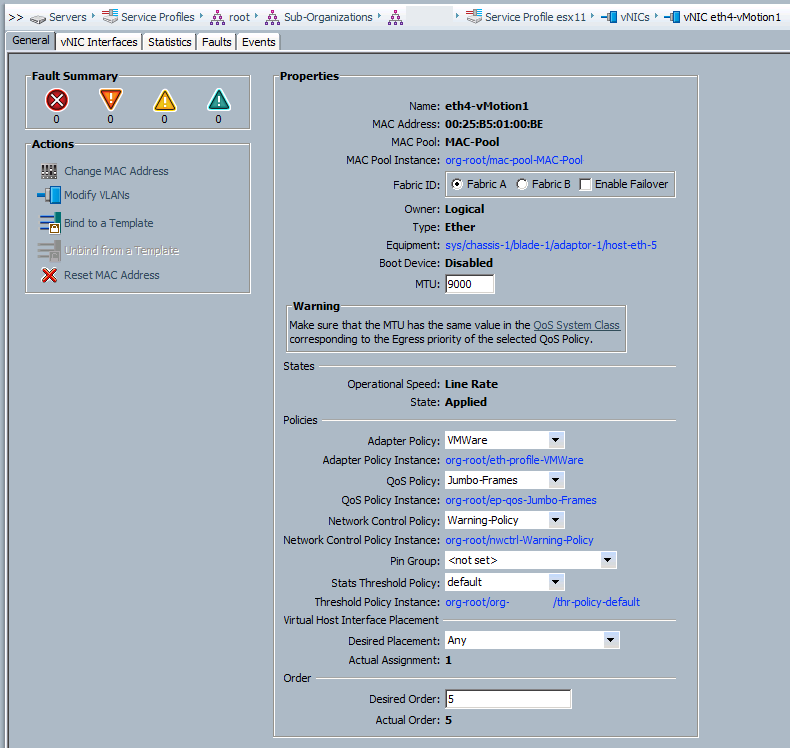 Just changing the No C-States to the C6 States will allow you to install and run ESXi 5.0 on the HP ML110 G7. 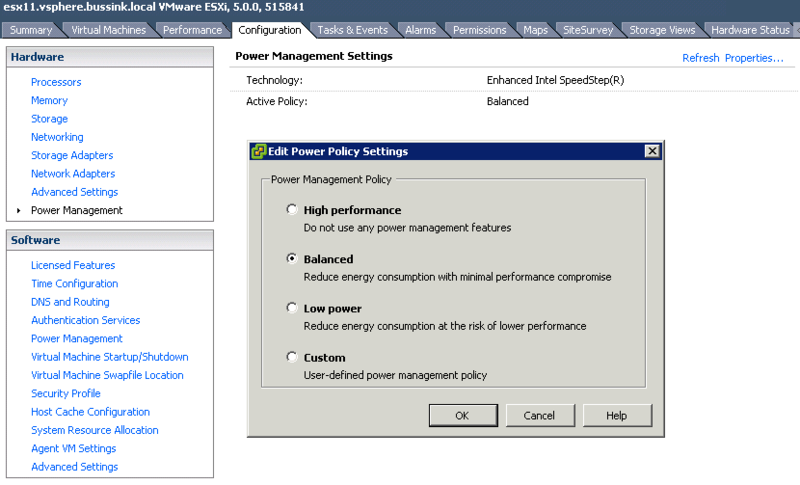 And a closer look at the Power Management Settings tab from vCenter 5.0. You can now change the power settings without having to reboot and modify the BIOS. I hope this will be usefull to other people in preparing their VCP5 Certification and for a great home lab equipment. 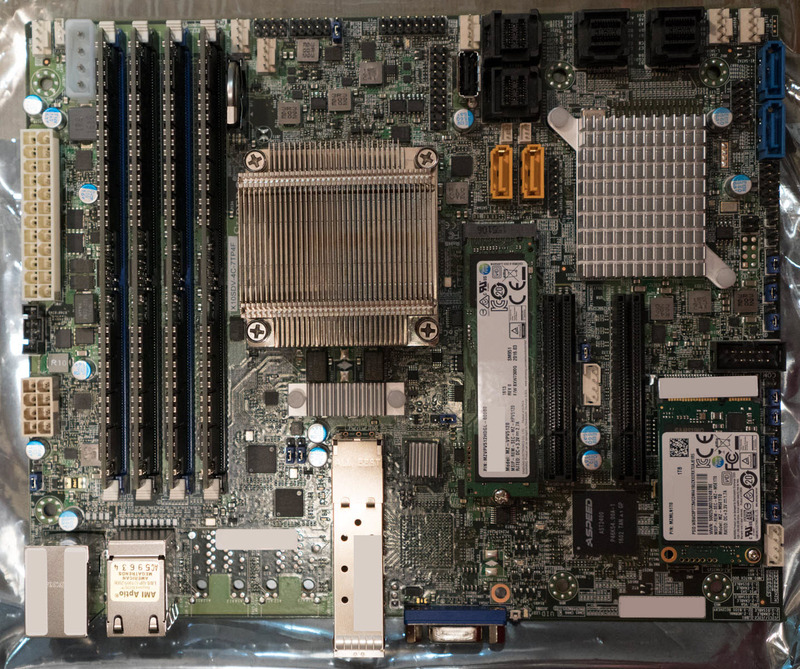 And for those that want to test further, the ML110 G7 supports Intel VT-d.
I’ve been deploying a Cisco UCS Chassis with multiple Cisco B230 M2 Blades. Yet the uplinks switches of the Fabric Interconnect are medium-Enterprise sized Switches, and not some Nexus 5K or better. In a vSphere 5.0 cluster designs you add one or more NICs to the vMotion interface. With the enhancements of Sphere 5.0 you can combine multiple 1G or 10G network cards for vMotion, and get better performance. 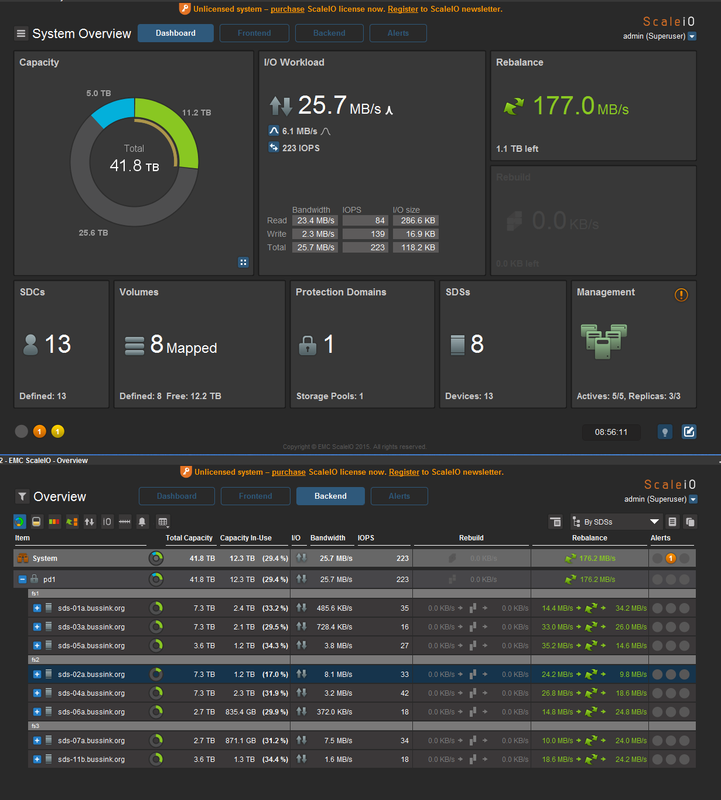 I was a bit worried by having my ESXi 5.0 vMotion traffic go up the Fabric Interconnect from my source Blade, across the network switches and back down the Fabric Interconnect and the target Blade. 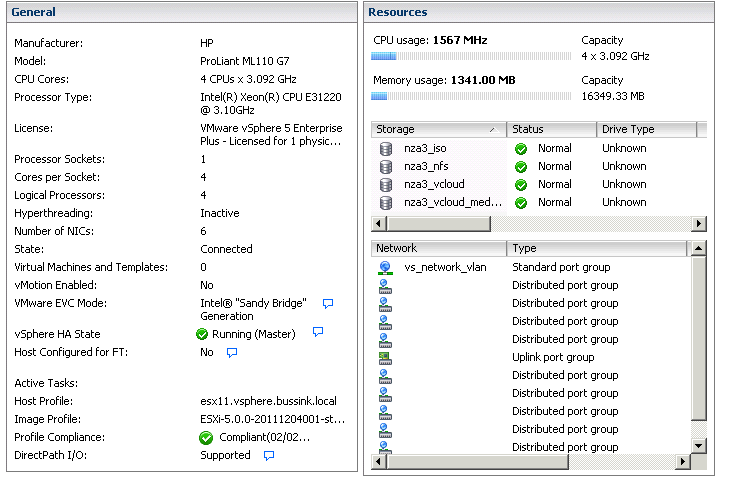 I decided to create two vmkernel port for vMotion per ESXi, and segregate them in two VLAN. Each VLAN is only used inside one Fabric Interconnect. And now let’s try this nice configuration. 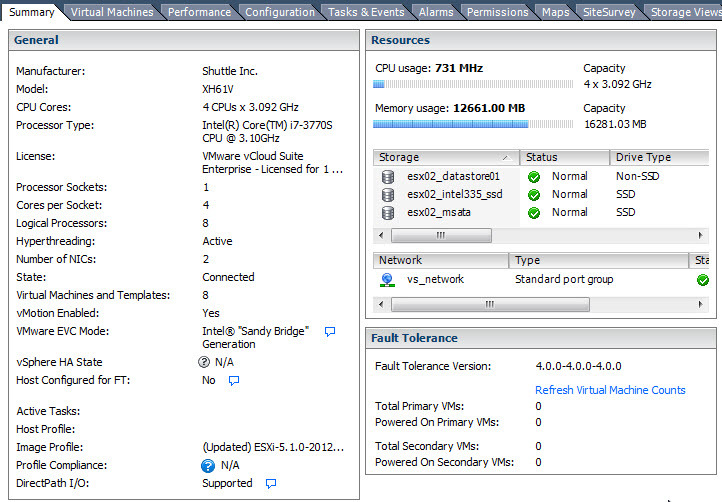 The VM that would be used for testing purposes is a fat nested vESX with 32 vCPU and 64GB of memory (named esx21). 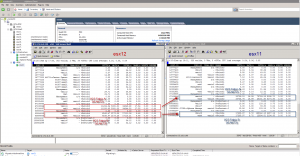 It is vMotion’ed from esx12 (Source network stats in Red) towards esx11 (Target network stats in Blue). 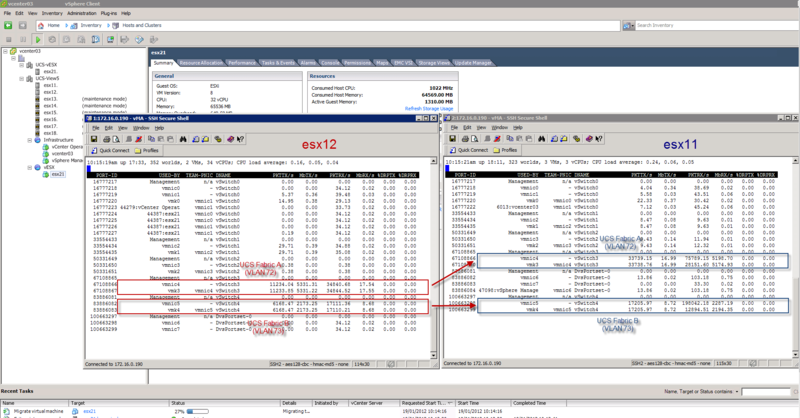 The screenshot speaks for itself… we see that the vMotion uses both NICs and VLANs to transfer the memory to esx11. 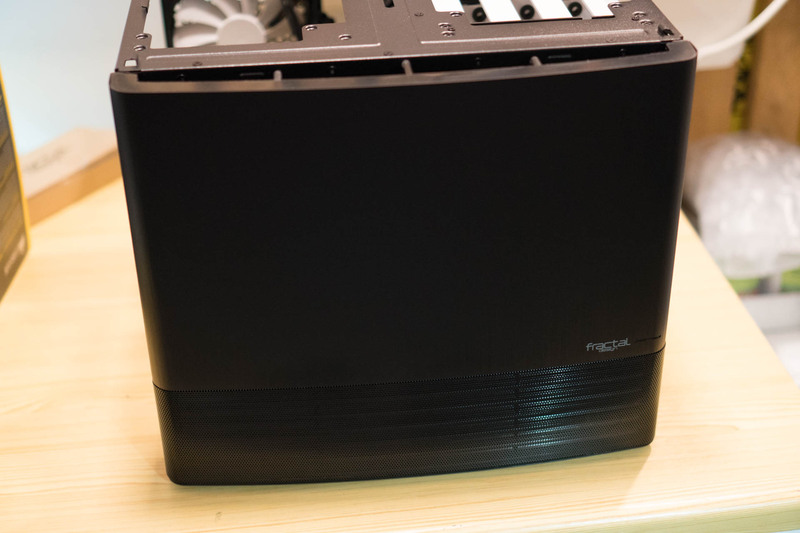 It flies at a total speed of 7504MbTX/s to 7369MbRX/s in two streams. One stream cannot pass the 5400Mb/s rate, because of the limitation of the Cisco 2104XP FEX and the 6120XP Fabric Interconnect. Each 10Gb link is used by two B230 M2 blades. If you want to learn how to setup Multi-NIC vMotion, check out Duncan’s post on the topic. Thanks go to Duncan Epping (@duncanyb) and Dave Alexander (@ucs_dave) for their help.